Karratha is a city in the Pilbara region of Western Australia, adjoining the port of Dampier. On the 11th (Fri), explore the landscape on two wheels at Yaburara Heritage Trail and then mingle with the ghosts of the past at Cossack Heritage Trail. For more things to do, where to stay, maps, and tourist information, use the Karratha trip planner . Melbourne to Karratha is an approximately 7-hour flight. You can also drive. The time zone changes from Australian Eastern Standard Time (Victoria) to Australian Western Standard Time, which is usually a -2 hour difference. Finish your sightseeing early on the 11th (Fri) to allow enough time to travel to Coral Bay. Coral Bay is a small town on the coast of Western Australia, north of Perth. You'll enjoy a bit of beach vacationing at Coral Bay Beach and The Coral Bay Shark Nursery. Take a break from the city and head to Dolphin & Whale Watching and Aqua Rush. Next up on the itinerary: identify plant and animal life at Ningaloo Marine Park. To see photos, ratings, reviews, and other tourist information, read Coral Bay day trip tool . You can drive from Karratha to Coral Bay in 5.5 hours. Another option is to fly. Finish your sightseeing early on the 14th (Mon) so you can drive to Kalbarri. Step out of the city life by going to Rainbow Jungle and Kayaking & Canoeing. We've included these beaches for you: Chinaman's Beach and Port Gregory Beach. There's much more to do: explore the activities along Hutt Lagoon, identify plant and animal life at Blue Holes, take in the dramatic natural features at Zuytdorp Cliffs, and take some stellar pictures from Red Bluff. To find more things to do, traveler tips, other places to visit, and other tourist information, read our Kalbarri online trip itinerary maker . Getting from Coral Bay to Kalbarri by car takes about 7 hours. Other options: take a bus; or do a combination of bus and flight. Cap off your sightseeing on the 19th (Sat) early enough to go by car to Geraldton. Geraldton is a coastal city in the Mid West region of Western Australia, located 424km north of Perth.At June 2015 Geraldton had an estimated urban population of 39,825. Visit St Francis Xavier Cathedral and Point Moore Lighthouse for their historical value. 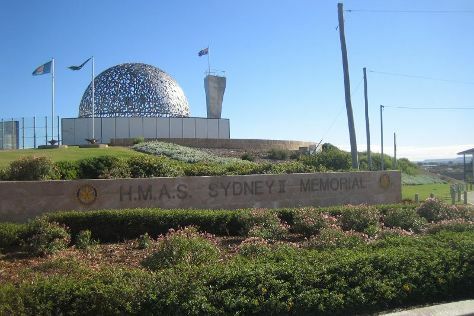 Get a sense of the local culture at HMAS Sydney II Memorial and Museum of Geraldton. The adventure continues: stroll through Town Beach, look for all kinds of wild species at Coalseam Conservation Park, enjoy the sand and surf at Pages Beach, and get engrossed in the history at Monsignor Hawes Heritage Centre. For reviews, traveler tips, and tourist information, you can read our Geraldton trip planner. Traveling by car from Kalbarri to Geraldton takes 2 hours. Alternatively, you can do a combination of taxi and bus. In October in Geraldton, expect temperatures between 30°C during the day and 13°C at night. Finish your sightseeing early on the 24th (Thu) so you can travel to Jurien Bay. Jurien Bay, is a coastal town in the Wheatbelt region of Western Australia, 220km north of Perth facing the Indian Ocean.HistoryThe coastline around Jurien Bay was first known to Europeans in the 17th century. Escape the urban bustle at Fishing Charters & Tours and Sandy Cape Recreation Park. When in Jurien Bay, make a side trip to see Museum of Central Australia in Three Springs, approximately 1h 40 min away. And it doesn't end there: don't miss a visit to Jurien Bay Jetty, stroll through Jurien Bay Marine Park, grab your bike and head to Turquoise Way Trail, and take some stellar pictures from Molah Hill Lookout. For reviews, traveler tips, where to stay, and more tourist information, refer to the Jurien Bay itinerary site . You can drive from Geraldton to Jurien Bay in 2.5 hours. You'll set off for home on the 28th (Mon).